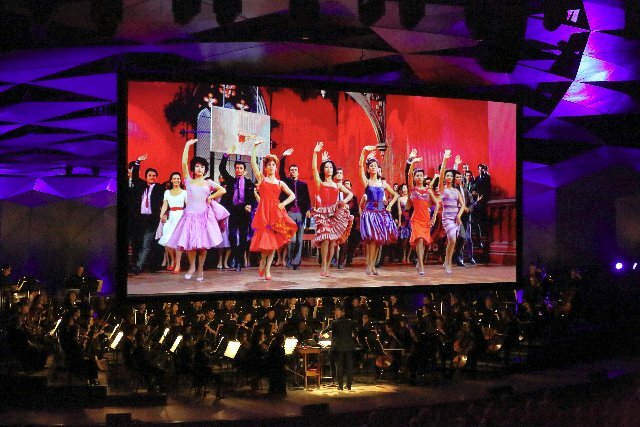 David Newman led the Boston symphony Orchestra (BSO) to a triumphant musical presentation of Leonard Bernstein’s electrifying score of the 1961 remastered, high definition West Side Story. It was shown for the first time on Tanglewood's new monster size screens. The digital screens are the biggest technological advancement at Tanglewood in years. They are billboards that convey their message in brilliant color, day or night. The adapted classic of Shakespeare's Romeo and Juliet, a romantic tragedy, was directed by Jerome Robbins and Robert Wise. Lyrics were by Stephen Sondheim, who, according to folklore was going to reject the job until his mentor, Oscar Hammerstein, convinced him. Hammerstein served as Sondheim’s sounding board, since the relationship with his father was questionable. After conversing with music critics we learned that the most challenging conducting job is synching live music with film. You have to be ‘spot on’ as Newman was. Each time he lowered the baton to the computer, a gigantic image of a circle appeared in the center of the screen-guessing. It was relaying the message that you are on target and in synch with the film. The BSO performed the entire score without a hitch. David Newman has composed more then one-hundred scores for films The lawn and Shed at Tanglewood were filled to capacity. Movie night has always been popular at Tanglewood because of the now elderly John Williams. This iteration was particularly satisfying. The 100th Bernstein Birthday Anniversary at Tanglewood is in full swing. There is still more to come. Consider what makes West Side Story such an icon of the 1960s. Winner of: Ten Academy Awards; Best Picture (1961) and Two Tonys (1957).